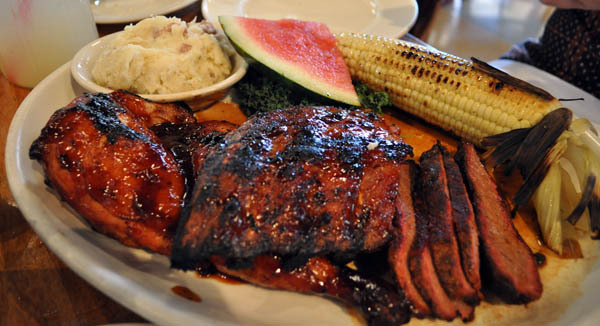 Lucille’s BBQ is similar to a Macaroni Grill but mostly exists in California (There is one in NV and AZ). It’s a BBQ chain with a lot of good critical acclaim from some of my friends so it was natural to check it out. By the way, I’m very skeptical of good BBQ in California since I’ve never had BBQ here as good as the Midwest. I think this is the original, but not sure. 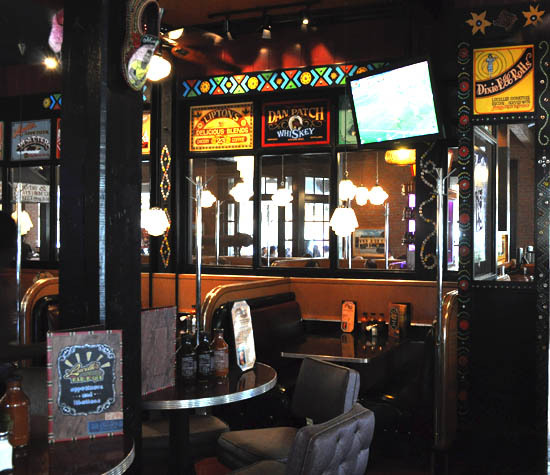 If you go to the website you can read the interesting back story for this place, of which I think is fiction because the restaurant feels like a Bubba Gump’s or any of those themed chain stores. 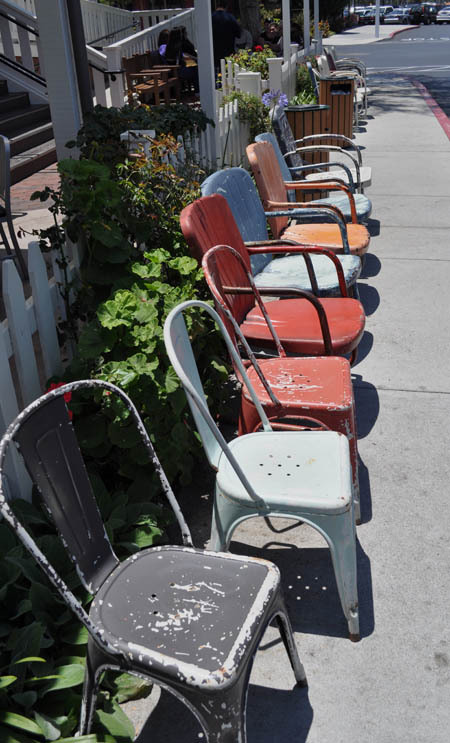 Beat up chairs to get us into the backyard BBQ mindset. So the generic feeling decor is a dead giveaway that this is a corporate chain, but that doesn’t mean the fewd has to be terrible. I myself enjoy Macaroni Grill and Gordon & Bierch quite a bit. So one can see that this is really obviously a chain. The story inside the menu is garbage since it doesn’t even mention what type of BBQ region this restaurant represents. 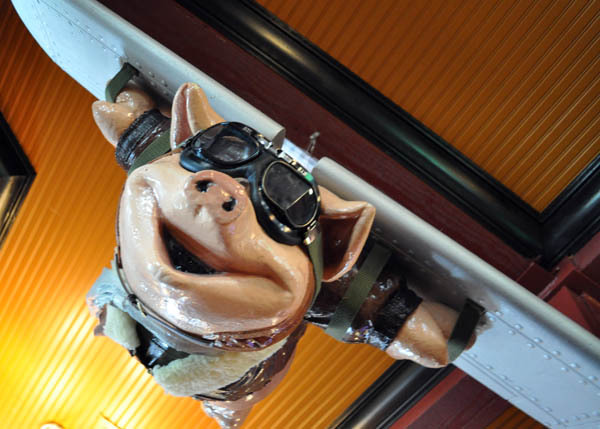 Is this just Tony Roma’s in pig’s clothing? The biscuit was light in texture with a light savory flavour. 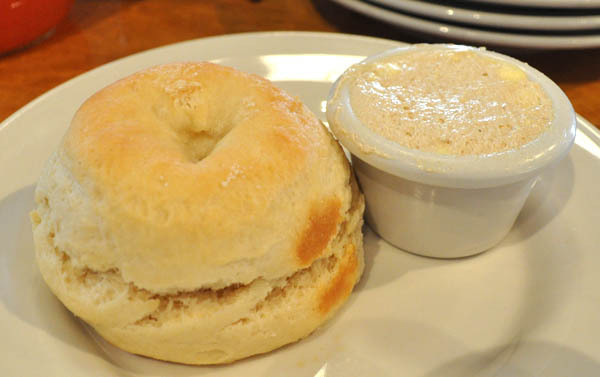 The apple butter has cinnamon and about 100 cubes of sugar in that little cup. 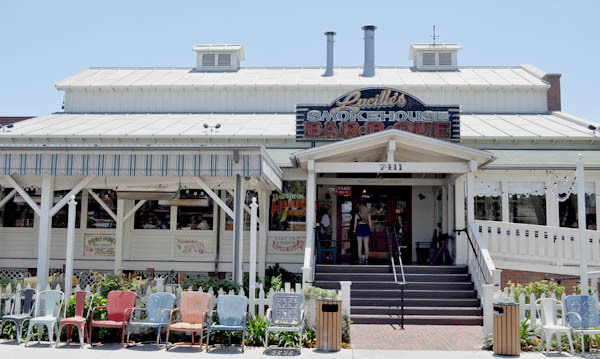 Most of the time, places like this has excellent bread for the patron to dine on, Lucille’s is no exception. These biscuits are delicious and unlimited, oh and best hot. When I arrived, a couple of my friends were sitting at the bar. 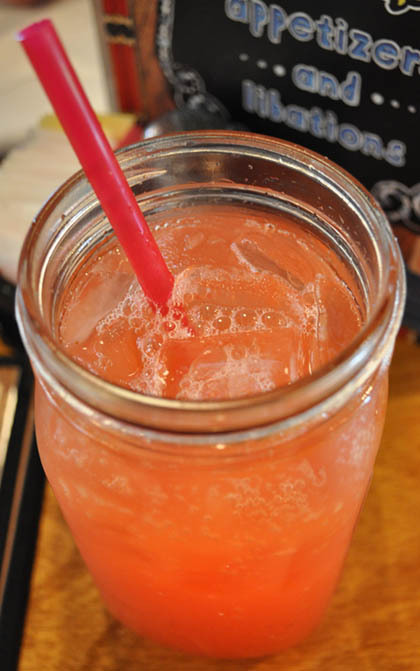 One had this bright pink concoction, the outside of the ball jar was covered with condensation. I was quite thirsty, so the drink envy in me took over and I ordered one for myself. It’s nice and cool but diabetic shock sweet. It’s not tart at all, which lemonade should be. I’m thinking the lemonade part or all of it came out of a drink dispenser fountain. Singed on the grill with butter and salt, this is a rather basic corn on the cob. It wasn’t bad, but the quality of corn wasn’t quite there. 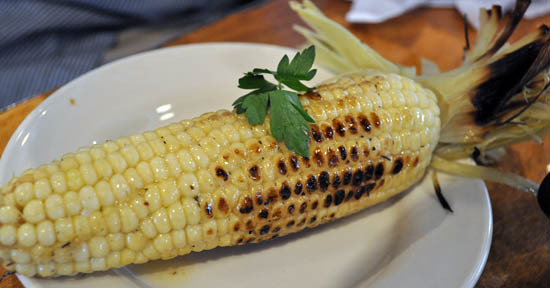 I am an avid grilling junkie and the secret to good corn is to get in season where it’s juicy and sweet, either soak it in water and grill it in the husk, peel the husk, salt and eat. Or do it like KFC and baste the naked cob in butter. Porch Platter I had consisted of the baby back ribs, BBQ tri-tip and BBQ chicken. Side was mashed potatoes, grilled corn and a slice of watermelon. The baby back ribs had a good sweet tangy flavour even without additional sauce. The ribs were not very meaty though. Perhaps the St. Louis ribs would have been a better choice. A friend had beef ribs, while they looked huge and delicious, he said they were incredibly difficult to eat and not super tasty. The tri-tip was tender and just a bit savory. They benefit quite a bit from the addition of sauce which I will explain later. The BBQ chicken was excellent. We saw them grilling some chicken that came out of trays full of chicken and marinade. The piece of chicken breast I ate was very juicy and covered with tangy BBQ sauce. This leads me to believe the chicken has been soaking in that marinade for quite some time, add to it that they smoke their protein, there is probably little loss of juiciness. The mashed potatoes were not spectacular and served as an ok side. I actually ate a biscuit with my BBQ. I heard the brisket is very good but did not get to try any this trip. My friend ate this sandwich. He said it was pretty good and finished the whole thing so I’ll have to take his word for it. There are three types of sauces at the table. Memphis BBQ sauce has some mustard in it and is much lighter in colour. The original is sweet and just slightly tangy. The hot and spicy was my favorite with a little more kick and little less sweet than the original. You can buy these at their online store for about four bucks USD a bottle. This is where they cook a lot of the protein. While we were eating, a batch of pork ribs came out. They smelled really good and were piled up to about 7 feet. 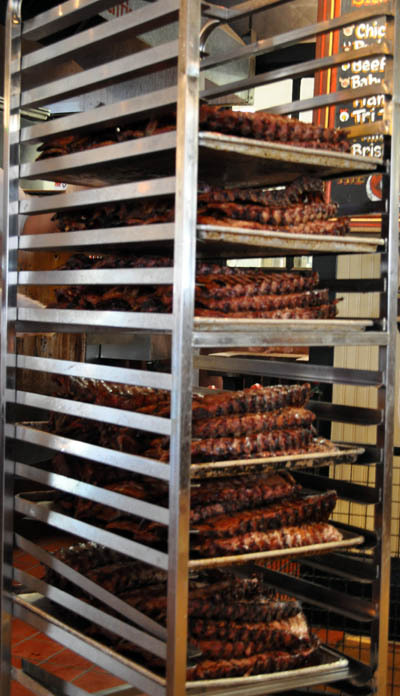 There was a manager watching the whole process so I assume thievery is a problem when they are taking fewd out of the smoker. 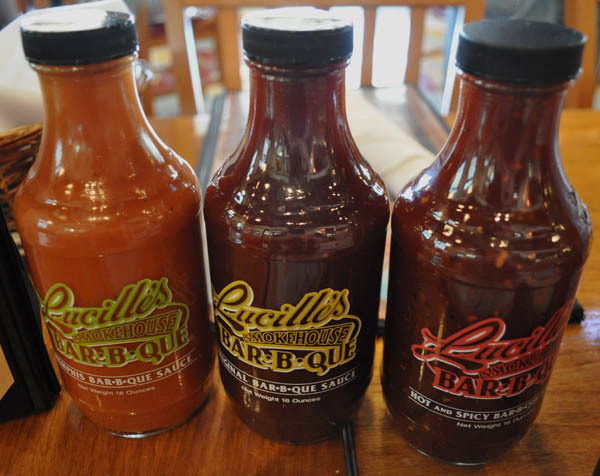 If I’m ever in the mood for BBQ again, Lucille’s is a viable option. It’s prices are reasonable for the massive amounts of fewd you get. There’s a lot of different types of BBQ to try. The service is well trained and friendly. 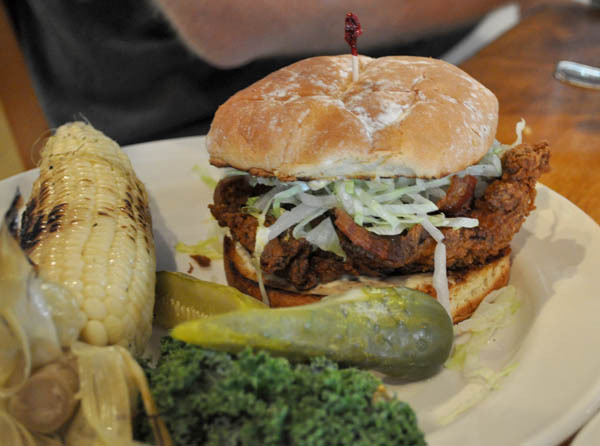 The never ending biscuits and apple butter is great as well as their chicken. The only thing that’s kind of weird is the synthetic corporate restaurant atmosphere. Basically you can tell they are trying really hard to seem authentic with their stories and fiberglass decor. On the website, they even say that a lot of their decor can be found trolling on ebay. The corporate restaurant mentality is hard to avoid, so keep that in mind. Pricing: Med for BBQ in California. 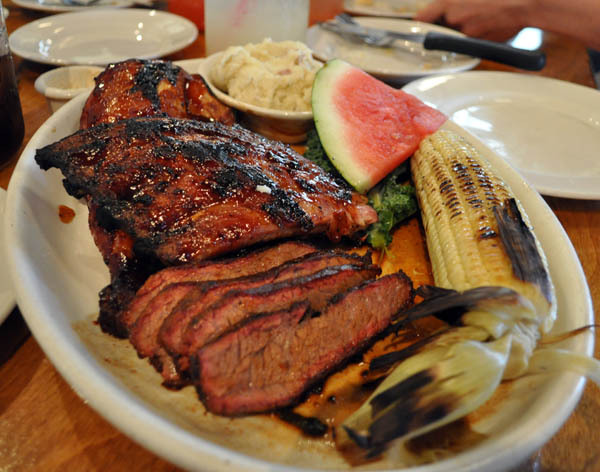 The average BBQ dish is about 20 dollars and you can even splurge for a 200 dollar BBQ super feast. Food: Good. Pork ribs are a little on the thin side, but still tasty. Signature Dish: Biscuits with apple butter. I don’t know if the BBQ chicken is a signature dish, but it should be. Facilities: Very clean with tables spaced apart decently. As mentioned before it has a corporate restaurant feel. The chairs slide on the floor quite a bit though. I can only imagine it was lubricated by BBQ sauce spillage. Service: Great, our beverages were constantly refilled and plates cleared. Also if you like the biscuits, just keep asking for more and they keep bringing them. Hello,I log on to your blogs named “Lucille’s Smokehouse BBQ (Long Beach) |” regularly.Your story-telling style is awesome, keep it up! And you can look our website about تحميل اغانى. That is disturbing, sorry about your experience. My experience was awful. I witness rude staff servicing White clients prior to African Americans that was present before other clients arrived. I will not patronize establishments of this nature. This is a free country. I compared Lucille’s to Macaroni because of the corporate feel I got from dining in the restaurant. I mention I do not dislike this feel and it all depends on execution. Compare if you will to Danny Meyer’s USHG. They have less restaurants than Lucille’s and Hof’s but are considered one of the large restaurant chains in New York. 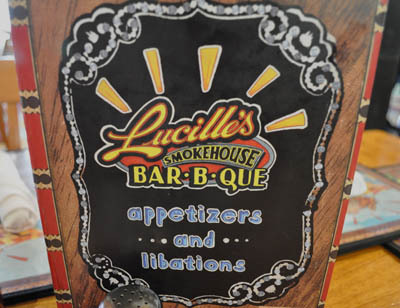 To me the service and atmosphere at Lucille’s is highly controlled to the point that it’s not hidden. Perhaps they are trying too hard for me, especially for a BBQ place. I honestly believe that any restaurant with a real VP has to be considered a chain. But let’s not argue semantics here. I did enjoy my experience there and will mention again that I would go back if given the opportunity. Second, I am the son of the VP, and this is NOT a large Corporate chain. I remember when the first one was being built in 1999, and I’ve been to all of them, which isn’t that hard, since there are only around 12 or 13. 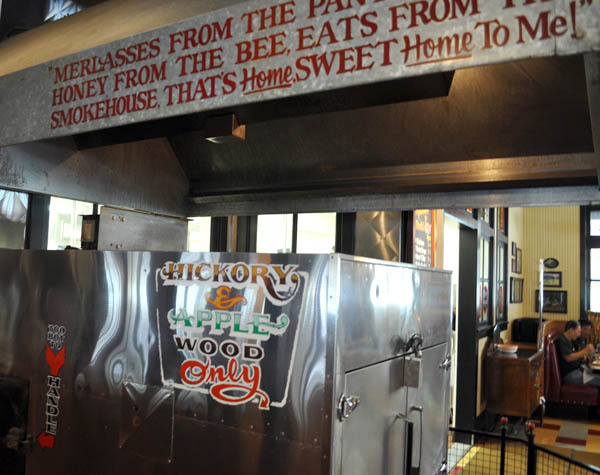 The owner also owns Hof’s Hut, which was passed down to him by the original owner. I know him, and he himself found a lot of the original decor on ebay and at flea markets. It is still found on ebay to this day. They have a very small corporate office in Long Beach. This is still a small family owned chain, and every one is made just right and the owner visits each one frequently.